This smaller scaled sectional, perfect for an apartment, condo, or smaller living room, is made up of two loveseat- sized sectional pieces creates a cozy place to gather with friends and family. Enjoy the sophisticated styling of the rolled arms, high back cushions, and casual contemporary tapered wood feet. With many different configurations and fabric options available you are sure to create a sectional well suited to your lifestyle and living space. The 110 Loveseat Sectional Group by Lancer at Belpre Furniture in the Belpre and Parkersburg, Mid Ohio Valley area area. Product availability may vary. Contact us for the most current availability on this product. 118 LF Arm Loveseat 1 66" 35" 35"
112 RF Arm Loveseat 1 56" 35" 35"
Fabric Options Patented superior rate 2.0 resiliency high-density foam cushions. It retains the majority of its original shape and comfort is better than most foam cushioning available today. The 110 series sectional collection gives a number of choices for creating an inviting sectional to use and enjoy in your home's living room, family room, or great room. 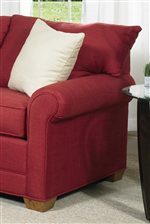 The sophisticated yet casual style features rolled arms, high back cushions for comfort, and tapered wood feet for style. Additional pieces are available to create alternate sectional sofa groups including versions with a sleeper sofa as well as a stand alone sofa with two arms, a loveseat, and chair and a half. Customize the final look of your sectional with your choice for fabric with a special order. The 110 collection is a great option if you are looking for Contemporary furniture in the Belpre and Parkersburg, Mid Ohio Valley area area. Browse other items in the 110 collection from Belpre Furniture in the Belpre and Parkersburg, Mid Ohio Valley area area.